So has it been mentioned that the lower the max current the lower the lowest level is? I assume that's the way it works. Now I need to set up a mizer mode and a one level 2200mA mode. It's like having three lights in one. Brightness level 1 is about 0.3% of the maximum output current. In case of the stock 1400 mA maximum output this is about 7 mA. This is however close to the absolute minimum output current that can be achieved with the driver, so the lowest brightness level will not be much lower even if the maximum output current was calibrated to only a few 100 mA. I'm curious what that absolute minimum is. I am a little late joining the latest discussions but i'm really glad to see that your experience was mostly good so far with getting the driver configured through the setup mode. That is a great writeup of your experience Calflash and i am certainly going to use some of your observations and questions for improving my instructions! For example i am going to make a table or graph that shows the drive currents of the 21 brightness levels depending on some maximum output currents, you are right that it will be easier that way to judge what brightness levels to choose. 1) The lowest possible output current is somewhere in the range of 6 mA. Since the driver calibrates its regulation to always achieve the absolute minimum output on the brightness level 1, there is not going to be much of a difference regardless of the maximum output current that you define with setting 16. Another word about the calibration: While it works pretty reliably, the best results for calibrating the minimum output current are achieved when the driver is at about ambient temperature and not hot. So in case you feel that the lowest level is not calibrated as it should be, let the driver calibrate again but let it sit for a few minutes after leaving the setup and before doing the calibration. You can abort the calibration sequence at any point before the LED has gone off after reaching the highest output. So if you do exit the setup and it starts calibrating, just turn it off and let it sit for a while, when you turn it on again it will do the calibration. 2) The PWM as i had detailed in an earlier post is only present in the brightness levels with less than about 20 mA drive current. You can see the PWM on faster moving objects. On the lowest brightness level you might notice a certain flicker in the output, that is visible without moving the light if you look closely. This is not actually the PWM. The use of this PWM dimming on the lower output currents is a necessary compromise that i hope most of you can live with. 3) I'm sorry that you had a hard time with the jumper PSM. I believe Calflash is right that less is more in this case. First of all you need to mix up the conductive silver filler in the paint really well. Then you should only apply a very thin layer, since the silver flakes need to dry to a flat layer to form a conductive bridge. If there is too much organics (paint) and too little silver filler then the dried result won't be conductive enough. But a solder bridge does work perfectly of course if you have a solder iron small enough. Its great to know that you are enjoying the setup experience Calflash and PSM! I did not have a small soldering iron. I cut a tiny pice of solder and placed it on the gap of the jumper. I then heated a pair of small tweezers on my gas stove (wearing a ove-glove) when the tweezers got hot I carefully touched the piece of solder. When it melted I lifted the tweezers away. Worked like a charm. The PWM on low levels really isn't that bad at all. It is there, but bearable IMO. Wow. Neat way to do it PSM! Thanks rush for the responses! preset 1) for multi-purpose use, 4 levels persistent (with memory), settings 1,11,17,21. I was shooting for a sampling to stretch across the brightness chart in the manual. preset 2) for work, 1 level, setting 16. With 3100 ZL batteries I hopefully will get around four hours on one charge. preset 3) for night time, 3 levels volatile (no memory), settings 1,8,21. Enough light to bump around in the dark without hurting night vision too bad, an extra boost if needed, and a super turbo if I have to check something outside. This is good to hear that the PWM isn't too noticeable and reading everyones preferences in settings is really getting me interested in getting a pair of these. 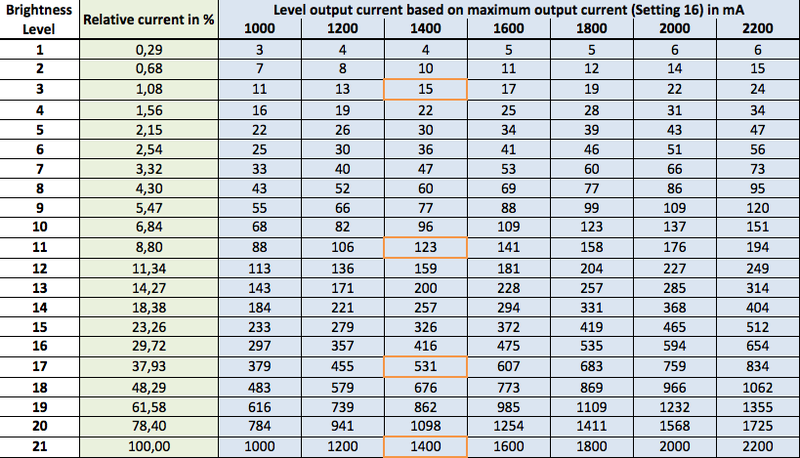 Following the suggestion by Calflash i have compiled a table that shows the LED drive currents for a number of possible maximum output current values. Remember the default maximum output current is about 1400 mA and the highest possible is 2200 mA. I have marked the brightness levels that are used in the stock configuration. The current values on the lowest brightness levels should be considered a good estimate, as the variance on these low current levels is bigger. I hope this table is useful to some of you to find the levels that you want to use. Keep in mind that in terms of perceived brightness the next higher level doubles the previous in brightness. I really like the way that you have set up your presets Calflash, you have come up with some very different brightness level setups for those different purposes. It does make perfect sense to use the volatile (no memory) mode for your nighttime use to make sure that you are not being blinded when you turn on the light, no matter what you have been doing with it before that. Do you find it quick and easy enough to load the preset that you need so you don't mind actually doing it? It is good to know that you didn't find the PWM on the lowest brightness levels to be a problem. It is visible when you look for it or when you shine the light on moving objects, but i tried to keep it from being irritating in normal use. Since i haven't heard any complaints so far it seems to work okay for most of you at least. THANKS for that chart - that is super cool and useful! I really appreciate the work you put into it. The presets are a super useful idea. This light can keep most of my flashlight personalities happy at once The sequence to toggle through the presets is a little long in that it actually requires me to think and count but I think that is a necessary compromise to prevent accidental changes. I have found that Don's suggestion for mode changes is the easiest for me when changing presets. I loosen the head just a tiny bit, and then hold the light like a lighter with my thumb on the head , and I press the head down for contact. This makes the mode changes very quick compared to the twisty twisty twisty method. Bottom line: the option to have the presets is well worth the price of the process to select them. I love the options to have volatile and persistent settings, the various brightness arrangements, mode number options, short off switching, and maximum current preference. I have yet to work on the thermal setting but I really hate it when I have a hot light so I am excited to delve into this feature as well. With all these options, I just don't know how anyone could be unhappy with the u.i. Like PSM said, it's like having three lights in one... one really cool one I might add. The night setting has proved helpful since I can count on it always starting on the lowest setting. The only input I could add would be a petty suggestion to expand the low range to allow for a lower low. But if asked to sacrifice other things on this driver, I wouldn't know what to give up. I just use my adjustable aperture (a.k.a. my pinky finger combined with an overhand grip) to dim it. The single mode setting has also been great! The light doesn't get hot, runs a long time, and doesn't accidentally change modes when I bump the tail. Don's design on this light is awesome and I would have bought it with any driver I am sure. But the fact that it is coupled with this driver makes this light untouchable from my point of view. If anyone is on the fence and trying to justify the price, I would suggest adding the price of your three favorite lights and comparing. It might not work out that way for you, but for me it's a cool deal. I eagerly await future McGizmo/rush projects. I really appreciate your elaborate reply, its great to hear how your experience with the driver has been so far! The presets are intended just as you are using them, you are proving that they can give you rather different types of flashlights by smartly choosing the number and range of brightness levels. Both the persistent and volatile operating mode have their advantages depending on your application. I would love to provide an even lower possible output, with the current hardware this is basically the limit though. The only way to get a little further down is by reducing the PWM frequency which is not desirable i think. However i will try to push the lowest output further down with future hardware revisions if possible. By the way, i have update the HiveLD web page with the results of the discussion and questions. Oh I have gotten it pretty hot! I have only ran it for 5 min or so at 2200mA. I am very impressed with this converter and the programming, unlike any of my other lights. The PWM is not bad at all, I'll say it again. I have not dove into setting up my other slots yet, but I am looking forward to it. Maybe I'll dive into the Hive when my AquaMule gets here. I have just started delving into the programming aspects of my Ram, it's quite overwhelming initially! I had no luck with the Caig Circuit Writer either, and thankfully the store refunded it. For $30 I'd expect better. Interesting to note the packaging states the pen has a 12 month shelf life, but there's no dates printed anywhere to check whether it's still 'in date'. Anyway, a few minutes with my soldering iron later and I'm in, and it didn't cost me a dime. The only thing I've done so far is bump up the stock number of levels from 4 to 5, in anticipation of making levels 1-4 roughly the same mA settings as stock, but having a 5th 'turbo' mode at 2200mA. I presumed the 5th level would be the same as the 4th for some reason, at 1400mA, but there now seems to be 5 spaced levels, with each brighter than the last. My question is, what are these levels? I can't tell whether a new brighter level has been added, or whether the new 5th level is the same as the old 4th level, with the other 4 levels spaced out evenly below it. I hope that makes sense! It's an elegant system anyway, it's impressive to have such comprehensive programming available with such a simple input system, and I look forward to spending a bit more time navigating through the settings and setting it up as I'd like. If I understand the manual right, unless you alter the brightness levels a five mode defaults to brightness levels 2, 8, 14, 18, 21. A 4 level default is 3, 11, 17, 21. So level 5 is still 1400ma like the old level 4 unless you adjusted setting 16 to max amperage of 2200. Then level 5 (if set to brightness level 21) will be 2200 which is sweet. The 2200 mA through the LED are certainly producing a good amount of heat, you will see the thermal output reduction if you leave it running for a little longer than that. There are default values for the brightness levels that are associated with the number of output levels that you configure with setting #2. You’ll find those defaults on page 8 of the user manual. They are listed under the setting #11 because with this setting you can tell the driver not to load the defaults when you change the number of output levels. With just changing setting #2 (number of output levels) to 5 as you have, you now have 5 well spaced output levels (brightness levels 2, 8, 14, 18, 21) where the highest output level is still 1400 mA. If you change the maximum output current (setting #16) to 2200 mA now, you will end up with actual currents for output levels 1 to 4 that are slightly lower than the stock drive levels 1 to 4. If you want to have output currents similar to the ones on the stock levels you can refer to the table in post #67. If you compare the currents for the maximum output current of 1400 mA to those for 2200 mA you find that you have to use the brightness levels 2, 9, 15, 19, 21. Thus you’d have to increase output levels 2 to 4 by one each. 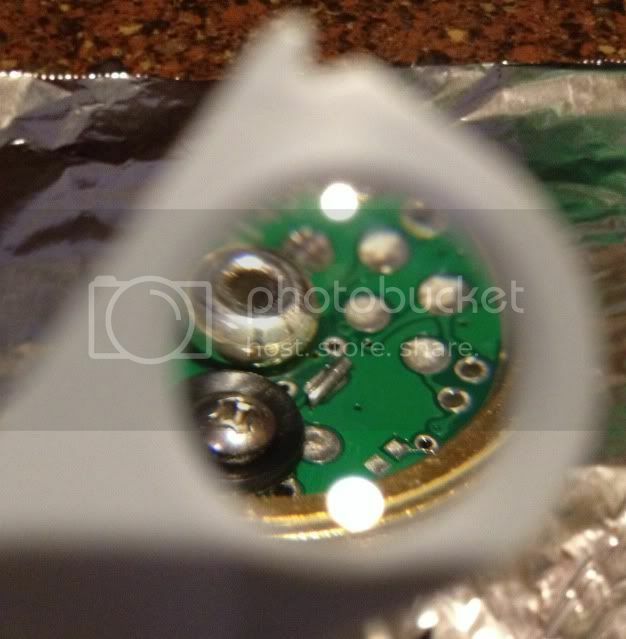 I’m glad you have been successful closing the jumper with solder, in fact thats probably the easiest method for all of you that have a smaller soldering iron (or if you use some trick as PSM has done . Its too bad that you also had trouble with the silver ink pen. While i don’t have a circuit writer pen but only some similar conductive ink in a small vial, i think that the problem is that when you first use the pen you always have a blob of ink with little silver in the tip, no matter how much you shake. If you first use the pen on some paper until you get a even silver colored trace and then just dab a thin layer of that well mixed paint on the solder jumper, it probably will work. Hopefully you will find the right configuration for yourself, i really appreciate the great feedback! Ok, so the wife and kids went to grandma's house. Time to program my AquaMule!!! If I can do this, anyone can, I AM NO MODDER!!! Pics taken with my iPhone through my SAK magnifying glass lol. Here's the jumper, the black channel going diagonal though that rectangle below the + battery contact separates the jumper, we need to bridge it with solder to access programming. Snip off a tiny piece of solder, and with tweezers (I used the ones off of the aforementioned SAK) place the small pre-cut piece of solder right in the black channel of the jumper. This time I used my solder knife, get it up to full heat, then very carefully with both hands just touch the piece of solder and it will melt into the channel. Or in my case just cover the whole thing. There ya go! Now you can access programming! I now have my AquaMule at 2200mA max. And low at level one, a real nice moon mode! I cant wait to use high mode tonight, high on 2200mA seems bright! 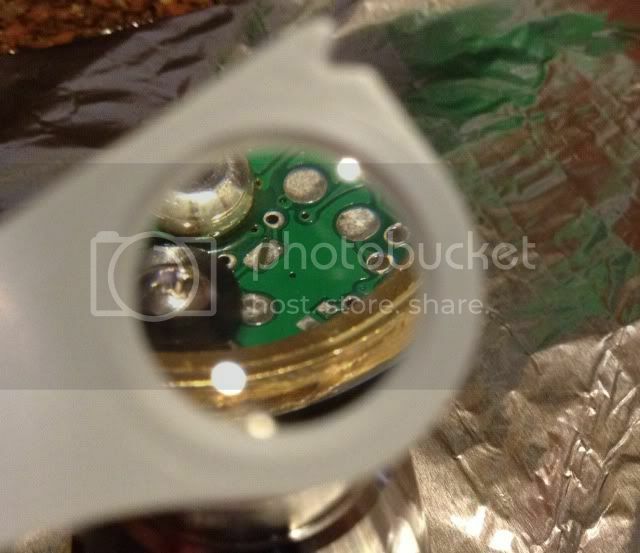 Thank you for sharing the pics of you solder job, well done! Even a thin bridge will do, it just needs to be connected electrically and a bit of resistance over the bridge would not be a problem neither. The AquaMule on 2200 mA should light up even a larger room or your backyard pretty well i think. Its good to hear that the brightness level 1 seems appropriate for the AquaMule. Quick question. Once #16 (max current) is set, is that the max current for all 3 presets, or can each preset have it's own max current? In other words, Can I have a max current of 2200mA for preset #1, and a max current of 300mA for preset #2? Hey PSM, I tried that and it didn't work. Got to looking at the settings chart in the manual and only settings 6-15 are preset adjustable. Me too just wanted to confirm. The maximum output current is not part of the presets, it is a universal setting that defines the 100% output current and the brightness levels scale to that value. Of course it is still possible to set up a preset that uses just lower brightness levels even if the maximum output current is set way high. I understand that just changing the one setting instead of a few brightness level settings would be easier. But it would also make things more complicated, i. e. every different maximum output current setting would have to be calibrated separately. Where I'm running into a mental block is adjusting each level. I want level 1 to be as LOW as possible, and level 3 to be as HIGH as possible. I've printed the manual, watched the blinks, and even successfully made it into settings 6 and 8. I finally gave up with my current level 1 (actually 6? ), 2 (actually 8?) and 3 (actually 9?) at default, which I could easily live with. 4 lumen, around 100 and around 430. Can anyone offer any advice to cut through my dense head as to how to easily reduce my level 1 to as low as possible and bump my level 3 to max? It's a cool problem to have!! First about what output level number you have to set. Depending on the number of output levels that you have chosen, the brightness level values for each are stored in the output levels number 1 to n, where n is the number of output levels. So you'd have to change the settings 6 (output level 1) and 8 (output level 3) if you want to make output level 1 as low as possible and output level 3 as high as possible. However when you changed the number of levels to 3, the driver actually has changed the values for output levels 1 to 3 to 5, 15 and 21 respectively. So output level 3 is already set to max. So all you have to do still is reduce the setting 6 value to 1 (the lowest). Remember you reduce the setting value by waiting for the LED to dim at 1.5 seconds after the second triple blink. I hope that helps you to master your quest! Thanks, Rush! I think we're good - somehow I stumbled into it before I read this. I bumped the max current up to 2200 and kept the levels at 3. So level 1 is 15 lumen, 2 is about 190, and level 3 is - wait for it - about 580! This based on my old reliable home made sphere. Couldn't be happier. For what I use this light for that's almost ideal. I'll probably be on level 2 75% of the time....level 1 when I'm trying to be stealthy, but level 3 when I want to really light 'em up. In real percentage gain, that's around a 35-40% increase in output, and that will be visible. And I really like having 3 levels - that's about right for me. No big deal switching with the "bump on the palm of my hand" technique. Yup, this is a great dog walking light! Heck, if I can do the programming, ANYONE can. Really sweet. I am an old pro at soldering but am very cautious when soldering printed circuit boards. My first two tries were cold joints, no closed circuit. When I finally followed my instincts and applied the solder until it flowed (as we all know is supposed to be done) the circuit was closed and I could learn how to program it. Compared with other programmable LED drivers, this one has a short learning curve and I will actually be to bed before 3:00. Quite a nice driver, set mine at 2200, level 1 at 3, level 2 at the stock 15 and level three (I went with three levels) at 21 and it is a heck of a light, might just be my favorite for awhile! Awesome that you have been able to get the maximum output bumped up to 2200 mA and are happy with the result! It seems to be a popular choice for most of you to increase the high to the absolute maximum current. But the Aqua lights do indeed quite well with such a turbo mode and can run on 2200 mA for several minutes before seriously heating up. Having 3 output levels is also my choice actually, i am usually going with a normal low on level 1, like the brightness level 5 that is the default for output level 1 when using 3 levels. thank you for sharing your success story, i'm glad you actually found the learning curve to be short. It was my goal to make the UI easy enough so that configuring the driver is possible for most everyone, i'm glad about everybody that has been successful! 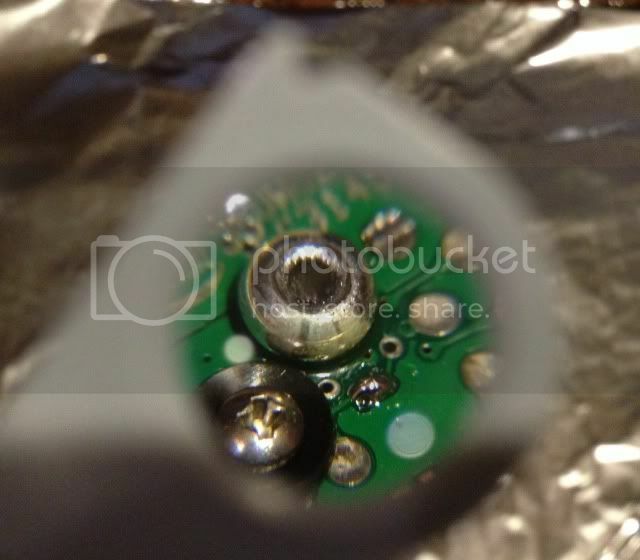 Good advise on checking the solder bridge carefully, it sure is tiny. Just a follow up on my aqua mule. I am now running three levels, 5, 15 and 21 at 2,200 ma, and find it to be perfect for my outdoor, take out the dog, scan the forest behind our house or go for a walk in the forest in the dark nightly adventures. It has replaced several lights. I used to use a medium level light to take the dog, garbage, etc out and then a heavy hitter like a TM 26 or an Olight SR 95 to scan the 30 acres behind our house before I go to bed. Now I just use my palm to kick the aqua mule up to 21 and I can see as far as I need to see with a much smaller light. If something looks wrong (or interesting) I can bring out the heavy hitters. May be a diving light, but it is really useful as an all purpose light for someone who lives in the country. Use the AA Haiku HiCRI around the house, and I am covered with McGizmo titanium goodness! DucS2R, you mean the Ram? Jeez, here we go again. Yeah, Ram, Ram Ram. Second time I have made that mule-headed error. I have a regular mule and love it, but not the aqua version. Thanks for keeping this old man in line! Heh heh, no problem! I agree with you though, the ram is great.